Every travel has it's tale. Every place has it's place in our memory. 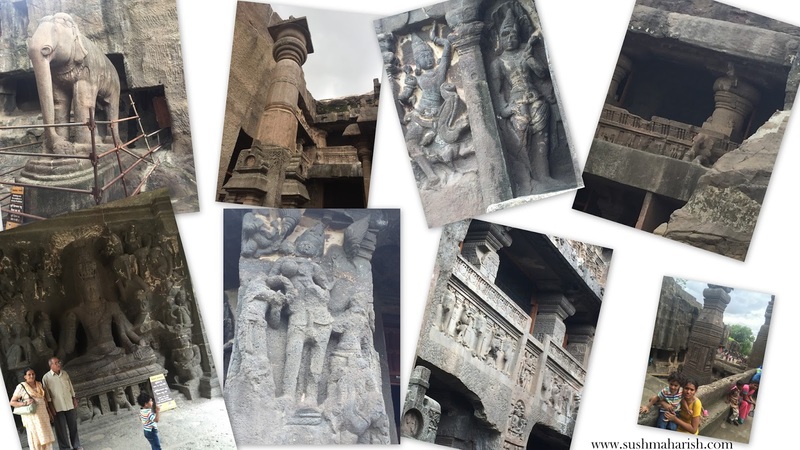 My visit to the Ellora Caves left me astonished. An enormous stone carved mansion with rich heritage and carvings all around. One would be left exhausted yet the place keeps you hooked on. Someone enthusiastic about archaeology would love to spend a few hours of hiking here. As for a scheduled traveler like me, it was a day well spent in the largest rock cut cave with my family, which also happens to be the UNESCO heritage site. 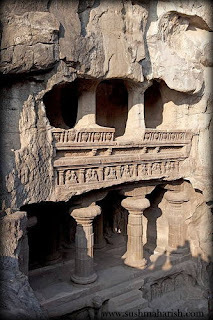 A quick introduction to the cave, located about 25km away on the outskirts of Aurangabad city of Maharashtra State. The very entrance welcomed me with a warmth reclining me into the ancient times of kings and queens, gods and goddesses. Spread over an area of 2 km and more the monasteries and temples include scriptures belonging to Hinduism, Buddhism and Jainism. 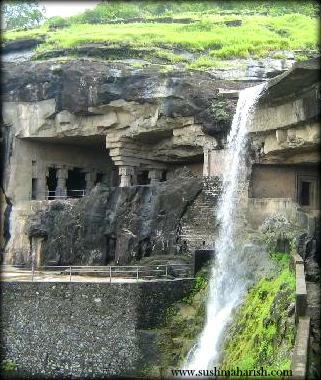 About 34 caves altogether and some water bodies including a water fall is the grandeur of the place. Maharashtra tourism should be lauded for the arrangement of the tour buses that take you to all the spots with scheduled time frames. My visit was limited to two caves in the three hours that exhausted my energy. The first being cave number 16, centrally located and popular for the Lord Shiva Temple. It has been carved from top to bottom so beautifully and has taken several decades and generations of hard work. I was left amazed at the intricacy of the architecture. The Kailashnath Temple in cave 16 is an epitome of architecture. Designated to recall Mount kailash which is the abode of Lord Shiva the Hindu God. This temple holds the distinction of being the largest monolith structure in the world. It has been carved out of a single stupendous rock mountain. I never knew about it! All my school history lessons seemed to vanish in thin air. 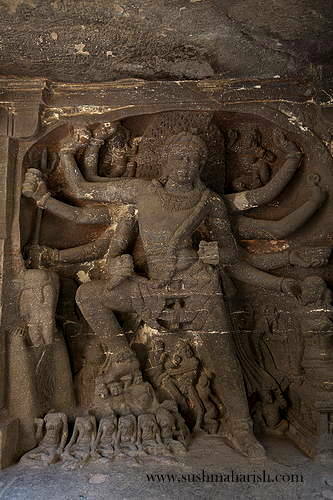 Lord Shiva in his form of "Gajanthaka" where he kills the elephant headed demon. On his side sits Goddess Parvathi. The serene interiors of the stone mansion did add some spiritual energy in me. As for the rainy weather that day, I was left with the camera in bag and had to rely on my phone camera. I have some random pictures herewith that depict the rich heritage of ancient India. 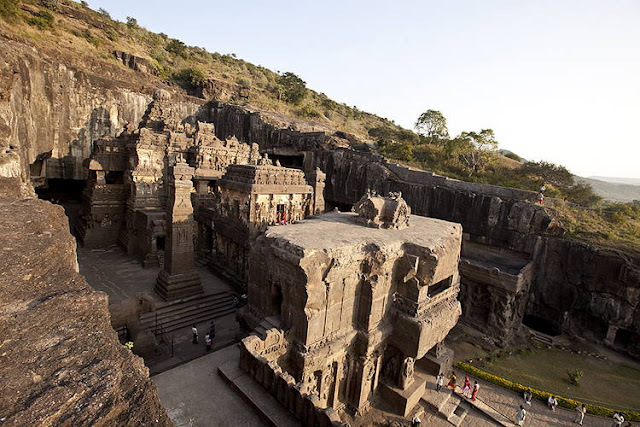 Ellora was earlier called Elluru and is a master piece. 1000 plus years ago, when no modern engineering technology existed, these enormous rocks were cut and carved. Hand made beautiful stone paintings leaves me with no words to express. Just glad that these were not during the regime of Shah Jahan! Notice the cave being numbered. The second cave I gave a quick visit was cave no 32. This belongs to the Jainism culture. This cave presents the temple of Lord Indra. It is believed that Jain community followers worshiped Lord Indra just like the Hindus and the Buddhists did. Though famished, we left the caves thrilled. It was not the end of the journey for the day. But we started with spiritual energy again. Touring around the city of Aurangabad itself can consume minimum of 4 days. However, in the scheduled one day tour, after the caves we could only visit following places (mentioned in key notes, but hardly have pictures to share) on our way towards Nagpur by road. 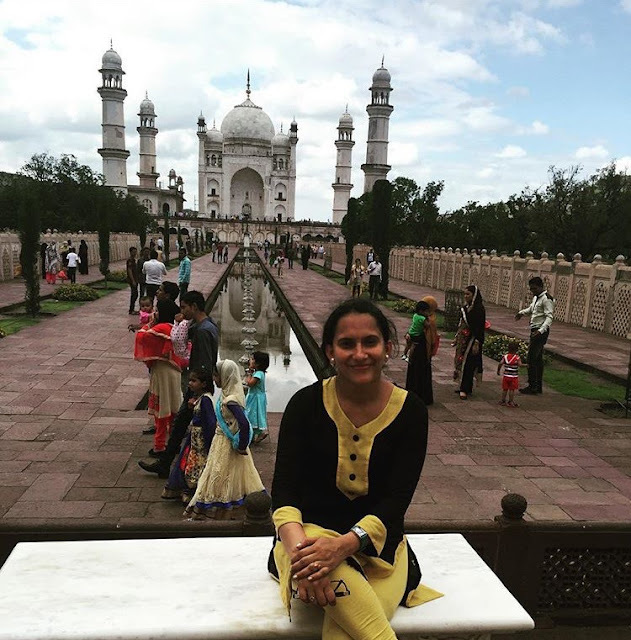 Ever heard of the duplicate of the wonder monument wah "Taj Mahal"? Well, I had not heard of too, till I was doing my homework on the "places to visit" around the Aurangabad City. My Aurangabad visit itself was enroute Shirdi from Nagpur and I ended up grinning seated at the Bibi Ka Maqbara. This Taj of the Deccan as it known as, is the tomb of Dilras Banu Begum wife of Aurangzeb. And it is built by their son Azam Shah. This is a short random video taken at the Ellora caves. Don't miss the last for a glimpse of the tour bus inside the caves. Ensure your backpacks have ample water bottles all along the touring. Please do not carry any snacks in your bags that can attract monkeys. Yes, there are plenty of them! A summer travel avoided is best. Tuesday is the weekly HOLIDAY. Cave entrance is open on all Sundays and national holidays. Other tourist spots around Aurangabad city that are worth seeing are Ajantha Caves, Daulathabad Fort, Grishaneshwar Joyotirling Temple. Note:- All pictures are iphone clicks and hence the clarity accordingly. Great pictures enhanced by engaging narration. And your pic in the end was a nice touch. Loved this. awesome shots, loved reading this, i have huge interest to visit this place from past several years but unable to arrange a trip.